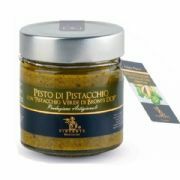 Pesto alla Genovese (Basil Pesto) - a traditional sauce from Liguria in Italy made with fresh basil, pine nuts and pecorino romano cheese. 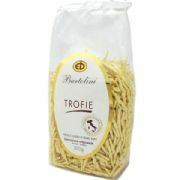 Pesto is an excellent sauce for spaghetti, linguine and trofie, just warm and add your favourite pasta after cooking. 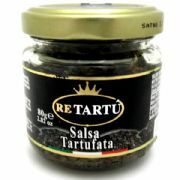 It can also be used as a sauce for rice or polenta, or add to soup to add a real depth of flavour. Ingredients: Basil 38%, Sunflower Oil, Olive Oil 9%, Cashew Nuts, mixed grated Cheese 4% (Cow's Milk, Salt, Rennet, preservative lysome of Egg), Rice Flour, Pecorino Romano cheese, Sugar, Salt, Pine Nuts 1%, flavours, Garlic 1%, Lactic Acid.